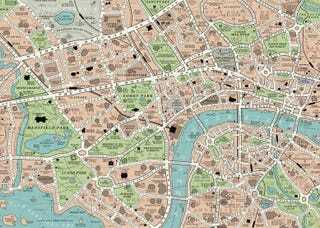 Art collective Dorothy has added to its collection of fiction-based maps (previous editions include a movies map in Los Angeles and a TV map in Washington) with a book map loosely constructed around Victorian London. So, in case you were wondering, Anne of Avonlea is at the intersection of Basil of Baker Street and The Angel of Nitshill Road. It's very fun to try to find your favorites on this map. The placements are based on the books' titles, so all works that reference streets are the actual lanes, references to bodies of water land the books in the blue portions of the map, and so on. It's the kind of map where Das Boot makes landfall at Watership Down.